PUT HIM IN THERE UNCLE B! PULLING NO PUNCHES, HELEN ANG ASK FOR IMMEDIATE BOYCOTT OF OUR RUNNING DOG MSMs. I feel like I’ve just been slapped, kicked and punched. And I am neither Indian nor Hindu. 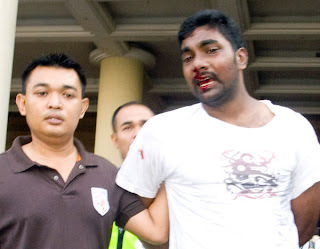 The way mainstream media (MSM) have painted our fellow Malaysians black makes me thoroughly sick. MSM have assaulted Indians through their derogatory portrayal of the community and it stings me. Aliran Media Monitor’s Diary has effectively dissected MSM spin on the Hindraf rally to show up how unconscionable their coverage has been. When a community with its back to the wall takes to the street, I sympathise. I do not mock the melodramatic form of their lawsuit and petition. I understand that the massive turnout on Nov 25 was a cry of distress. 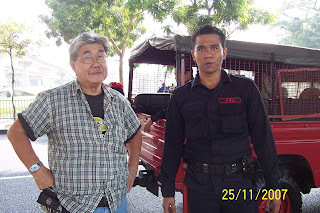 Nathaniel Tan’s ‘Why I will walk this Sunday’ is an eloquent peroration on why all Malaysians must wake up, now. I wish I had read Nat’s piece earlier but it was only uploaded on his blog Saturday – a mere day before the gathering was to take place. His exposition is something to turn over in our heads and help us in our soul-searching because Nat spoke straight from the heart. Mighty MSM, I’m afraid, speak from the pay pocket. 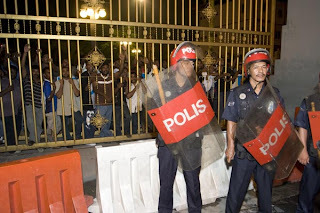 There was a dearth of information in the public domain running up to the Hindraf rally, and later contradicting accounts of what really happened. Which only indicates MSM have long since lost any right to call themselves ‘newspapers’. 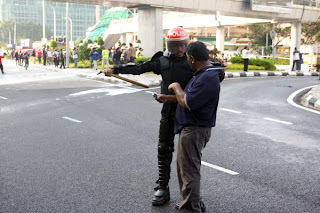 A fortnight earlier, the Star had quoted police on a crowd segment of 4,000 at the Bersih march. This small number is deliberately misleading. And again with Hindraf, MSM deliberately omitted an accurate depiction of the massive turnout. 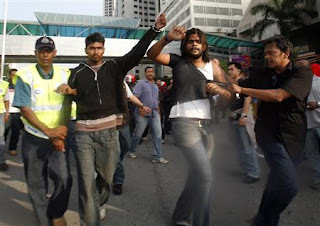 They failed to credit why Indians streamed into KL from all over the country. All they did was spin for their political masters. The Star peddles itself as the People’s Paper. This People’s Paper gave the Bersih rally all of a single page’s coverage, reflecting how much The Star thinks of the Malaysian people – us. It did not carry any picture of the crowds or of human beings. It had one photograph of motorcars stuck in a jam. When casino magnate Lim Goh Tong died, he was front page news. Bersih on the other hand was hidden away in the middle pages. The Star devoted seven pages to the late tycoon. And it talked about the Tan Sri for days after, to the extent of telling us how much his funeral wreaths cost. Lim is not ‘people’, he’s one person. Instead of the People’s Paper, the Star might want to consider tagging itself ‘the Very Important Person or VIP’s Paper’. Almost everyone took Surin’s flippant column at face value. She’s a well-known journalist who has advocated working within the system. 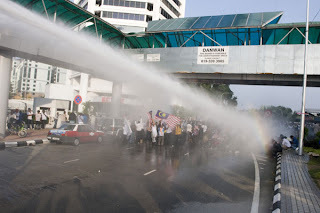 However, her own take on the Bersih march is surely an indictment of the system’s limitations. ‘Proper channels’ serve only to restrict the reporter and his report becomes equivocal. Surin is an assistant news editor no less; how would foot soldiers fare in trying to get their stories past the gatekeepers? Meaningful access to the public is ever so precious in these our turbulent times; Surin wasted hers talking about her irrelevant Saturday. I am going to fight for the public space which will enable a write-up like blogger Nat Tan’s unflinching Sunday to get the widest possible airing. The above question was tossed by civil rights lawyer Haris Ibrahim in The People’s Parliament. What Haris asks is urgent in view of the general election coming up. We need credible information. The public knew too little about Hindraf before last week and hence couldn’t make up our minds whether to support the march or not. So we don’t want to be confused by MSM lies when the election comes around. We need credible reporters to seek and speak the truth, even if these are citizen journos in pyjamas. There have been three street walks, all of them ‘illegal’. The authorities have criminalised the freedom to assemble peacefully – a right guaranteed us in our Constitution. MSM is in denial by making out participants of the walks to be the bad guys. 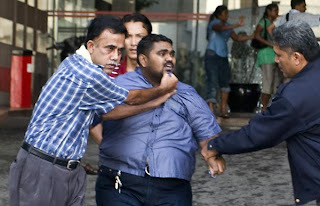 Newspapers are nothing more than errand boys delivering warning telegrams from Umno and its lackeys: May 13, ISA, sack teachers who support Hindraf and other innumerable threats. These newspapers do not have many credible news editors, only some incredible spinmeisters. 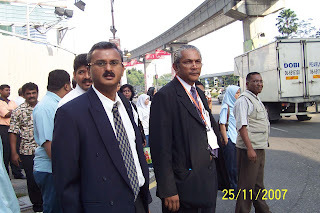 Not only does MSM keep us in the dark, they spooked us with Hindraf’s alleged sedition, left us wondering whether the gathering would proceed, and if another Ops Lalang was underway. We buy newspapers with the expectation of reading reliable reports but if these are not forthcoming, why waste money? Or pay to have our intelligence insulted. The act of saying ‘No’ to newspapers is hardly taxing for those of you reading this now. The harder task is to spread it as a national message and convince others. We are not breaking any law by making a personal decision not to buy newspapers. We are not causing trouble by refusing to read newspapers. We are not promoting racial disunity by boycotting newspapers. Religion is not in this picture frame. We’re doing good by saving money, close to RM1,000, in fact, if we cancel two annual subscriptions. Why do this? Because we are Malaysians with conscience and our conscience is troubled. We’d like everybody – anyone who reads online – to hop aboard and join in our demand for an end to MSM spinning and spinning webs of deceit. Connect with us on how to break the mighty MSM monopoly of the Malaysian mind. We’d like your participation at People’s Parliament. Cyberspace is as real as you care to make it. We can do more than talk. We can act. HE AIN'T NO RUNNING DOG. HE SNAPPED AT THEM! 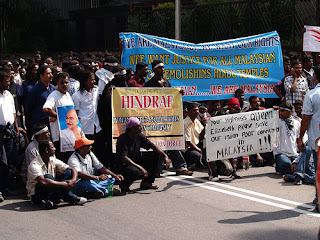 In a letter to Malaysiakini, Toh said the country had witnessed a series of protests over the past few months, the latest being the one organised by the Hindu Rights Action Force (Hindraf). 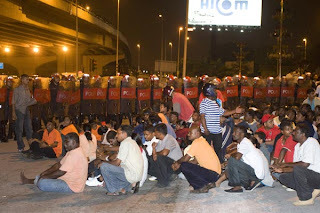 "These marches drew flak and condemnation from almost all BN leaders. Their criticisms centred on their illegality, potential threat to peace, the possible destablisation of the economy including frightening away foreign investors. I disagree with the views of our country’s leaders. "Instead of condemning, one would have thought and hoped that they should have been more concerned over the grievances, frustrations and disappointments that have brought so many thousands to the streets in the first place and to seek fair and just solutions to them," he noted. 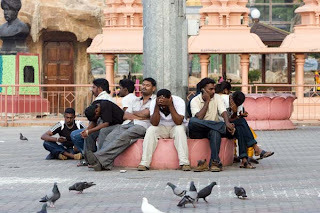 Commenting further on the Hindraf rally, Toh said the government must look into the grievances, frustrations and unhappiness of the lower strata of the Indian community and other communities pertaining to housing, education, health, jobs, equity and religious freedom. "Until and unless these and many more issues concerning our country's judicial and electoral systems as well as social justice for the poor are looked into seriously and satisfactory solutions found, the discontent that brought thousands to the streets over several months will remain. "To me, it is this discontent and unhappiness that will be a greater threat to our country’s peace and stability, rather than marches, pickets and demonstrations," he added. Datuk Dr Toh, Zorro salutes you! SAFFRON SUNDAY: 2nd DECEMBER - A CANDLE FOR THE LESS FORTUNATE. And did it THEIR way! CCC9 IS NOT A WASTE OF MONEY. THANK GOD SHE IS SAVE AND THANKS TO ALL WHO PUT IN AN EFFORT. THANKS FOR TAKING PART IN THE ALERT EFFORT. THANKS FOR PRAYERS FOR HER SAFETY. IT WAS NOT A HOAX, IT HAPPENED. PEOPLE PLEASE TAKE GOOD CARE OF EACH OTHER. "WHAT'S WRONG WITH OUR MALAYSIA?" JAKARTA BASED BLOGGER H C ONG (UNSPUN) ASKED ROCKY AND I LAST NIGHT! KNOW SOMETHING PEOPLE? EVERY TIME PARLIAMENT SITS I UNEARTH NEW FOSSILS. 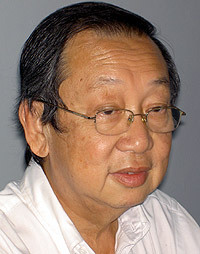 This piece above is the MP for Parit Sulong....he has a name but it is of no consequence. This other fossilised piece above is MP for Sri Gading.....where this is, is again of no consequence either. Until a few days ago I have never heard of these two characters. The ones you and I have heard about are the usual - the rat-brained slime-ball Sabahan, the one-eyed Jasin timber crook, the pervert who has tunnel vision everytime he sees a woman and who also condemns the disabled as cursed by God, the loud-mouth Minister of Taxis, and recently the tambi who fantasize about mud-wrestling with women MPs. These have already booked their crypt in our Tomb of Shame. Tuan Syed Hood bin Syed Edros [Parit Sulong]: [Some unrelated stuff first] Yang Di-Pertua, I would like to touch on a matter regarding the Ministry of Education, which are Christian missionary schools like Convent, La Salle, Methodist, and so forth. I was made to understand that the Board of Directors at these schools are partially administered by churches in foreign countries, for example in the Vatican City. I was also made to understand that the application to build a ’surau’ in some of these schools had to go through the approval of these Board of Directors whereby they are partially administered by the church. Therefore, it shames me that the school administrations are still controlled by the church. I was also made to understand that many Muslim parents send their kids to these schools, and that they have complained that sometimes, the school is started with church songs. I do not know if this is true, but what I discovered from these parents are the display of religious symbols. I feel disappointed that in an Islamic country, Malaysia, if I go to a convent school, the statue of St. Mary is displayed in the front of the school. 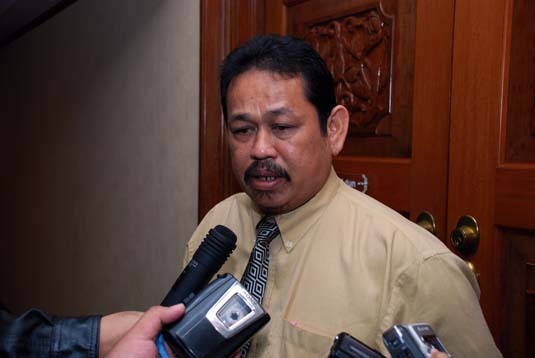 Tuan Syed Hood bin Syed Edros [Parit Sulong]: Please proceed, Yang Berhormat for Sri Gading. Timbalan Yang di-Pertua [Datuk Dr. Yusof bin Yacob]: Yes, Yang Berhormat for Sri Gading. Datuk Haji Mohamad bin Haji Aziz [Sri Gading]: I am not shocked at all, Yang Berhormat for Parit Sulong. It’s not just a simple question. The question is, why has this happened? One. During the last Hari Raya, I was told by a father, when Aidilfitri was celebrated, these types of schools were not closed. Thank you. 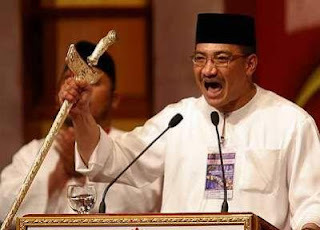 Tuan Syed Hood bin Syed Edros [Parit Sulong]: Not only statues, but fellow Yang Berhormat, go and see for yourselves, Christian crosses are displayed in front of schools. I do not understand the Ministry of Education, did the officers not see that, or is it our policy to allow such a thing? Nevertheless, I, as a responsible person to my religion, race, and country, I state my views that these statues need to be demolished, these crosses need to be destroyed and church influences in these schools need to be stopped. Also, the funds that are collected at these schools. Do we have a report? If possible, the ministry should reveal the funds for these schools. I was made to understand that these schools are also sponsored by the church. If I was a lawyer I could easily fry their asses, ferment them, bottled and label as "hearsay" exhibits. So what has our Deputy Prime Minister got to do with these two liliputians? Plenty, if you ask me. These two ignoramuses have just insulted DPM's former alma mater. He studied in a mission school, St. John's Institution, that is. Sir, I am sure you would want to say something to these two termites. Perhaps fumigate them out of Parliament. "The top leadership will not forget – and in a multiracial Malaysia the people will also not forget – those who have taken advantage to be popular for short-term gains," he said after attending the opening of the 19th Gerakan Youth and Wanita national delegates conference. "Their future will be tainted, and that applies to all young leaders who have aspirations to be national leaders," he said. At this point may I call on all Muslim Xaverians (Penang), Georgians (Taiping), Michaelians (Ipoh), Johanians (KL), LaSallians (PJ, Klang, Sentul, Peel Road, Brickfields), Paulians (Seremban), Franciscans (Malacca), all the Convent Girls and those from other Mission Schools throughout the country to give us your take on this issue. I received this alert from Haris Ibrahim. Dora Goh was allegedly abducted by three men in a Camry whilst she was parking her car outside the Padini Office in Glenmarie. Only information available about the car was its number 7641. I have called this number 012-328-5965 several times but got only a voicemail reply. I hope this is a hoax. Nevertheless I am posting this in the hope that somebody who knows Dora can come forward and tell us whatever is necessary. HAS THE STAR DEGENERATED INTO A POUND FOR STRAY RUNNING DOGS? 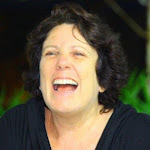 I am no journalist, but I have shared a table, broken bread or knocked glasses with the likes of the late David Tambiah, A Samad Said, Musa Scully, Norman Siebel, Cheryl Dorall, the late Francis Emmanuel, my cousin KC Boey, the late gorgeous mini-skirted Adelle Koh, Maurice Khoo, Citizen Nades, Fauzi Omar, Lazarus Rokk, George Das, Datuk Syed Nazri, Johnson Fernendez, Ahirudin Atan, Shamsul, Ben Cuehna, Rudy Beltran, HK Png (? ), Vera Pandian, Noraina Samad, Rose Ismail, Aisha Ali, Wahti and a few others, not because they are not significant, but because over time and less connectivity, I cannot recall them. I apologise to these. These were the thoroughbred journos who wrote without fear or favor and with extra doses of PASSION. These are the word-smiths that I try very hard to emulate in my postings. Except for less than a handful, most of them have ventured away from the mainstream media. Those mentioned above and who are still around have not been sucked into the whirlpoor of condescension, kow-towing and spinning that is the flavor favored by the mainstream media. I only read their pieces on their appointed days. I gave up the NST when it sued Rocky and Jeff Ooi and it was the same day that I opened this blog. I only read Sunday Star and thought I would try its daily. Both these MSM are mere daily newsletter of UMNO and MCA....deteriorated into abysmal daily sheets of fish wraps. Take the Star yesterday. They front-paged that the rally was a show of defiance. Have you clowns ever heard of civil disobedience. 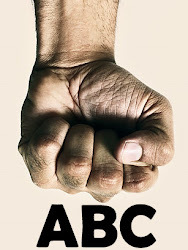 Does the name Ghandi ring some bell in your MCAed cranium? Court Order? You could buy court orders for pittance nowadays I have been told. Probably right, the state the Judiciary is in - another breed of running dogs, but benched. 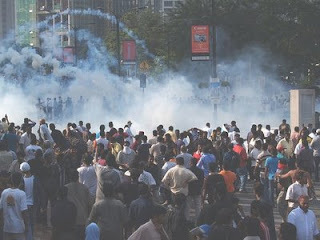 How come your reporters and photographers did not capture how the police defied Standard Operating Procedures by shooting their chemical-laced water canon DIRECTLY on the people? 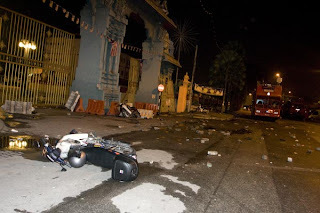 You reported a bus was razed from a Molotov cocktail in Batu Caves. Where is the photo. Hindraf transported the carcass to avoid your photographers. It is difficult not to capture on camera a burning bus. You people really are amazing. Talk about lies. Seven vehicles damaged but you forgot to photographed this bike overturned by the water canons. 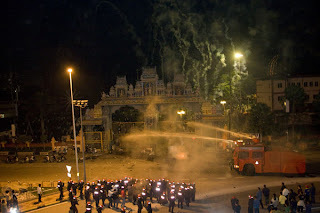 Today, your paper reported that the police did not fire tear gas inside the temple premises. No they did not....they dared not go into the premises after they forced the people into the premises. 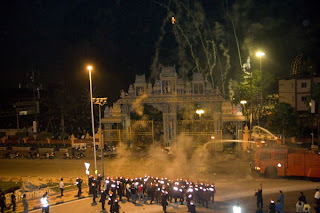 THEY SHOT THEIR WATER CANON AND CANNISTERS INTO THE TEMPLE PREMISES FROM A COWARDLY DISTANCE. What prove does the Star need....this picture and the one above doctored by bloggers? You are getting disgustingly infantile. Don't just parrot the cops. Which temple official called the police. What time? Who received the call? Your reporters dont know how to use the basic, WHO, WHERE, WHAT, WHEN, WHY, & HOW? Where are your photos of broken temple property? My 88 year old mum could do a better job if assigned. The gate seemed ok, even after the police forced them into the temple grounds. Then they did their bidding from, yes, a distance. Moving away to signal the start of the water and gas treatment of those already behind the gates. 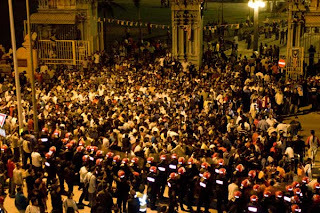 This crowd was told to get into the temple or they would be arrested. Your photographers must have been having breakfast and missed this saga of 5 vs 1 subjugation. Your guys missed a prize-winning shot. But running dogs always obey master. Eat your breakfast. Bollywood shoot? Helping or arresting. My mother, without her glasses, said arresting. 2 vs 1. Of course your master wouldn't allow this to go to press. Running dog running away from running press....or miss press run? Another Bollywood extra with studio make-up courtesy of police in mufti. Another 2 vs 1. Rehearsal punch or dry run. These running dogs are brave when the numbers are in their favor. 3 lawan 1. Star missed this too. Ooops I forgot - your boys were on tea-break. Friendly FRU pointing the way to studio for shoot....but you dont have to hold his collar. Your guys missed a good study on body language. Of course your guys missed this 5 vs 1 struggle.....the police give their personnel a chance to be photographed in situations like this. Good for head-hunting files just in case a government analyst needs more muscle or a Tan Sri feels that a guard house for the property is the in-thing in these days of rampant crime. You quoted Samy saying that MIC is aware of issues. These issues unsolved has brought about this rally. " 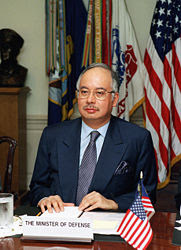 Dato Seri Abdullah Ahmad Badawi has been supportive and sympathetic towards our cause." This is typical running-dog-speak. What cause? Whose Cause? Here is another classic running dog spin: "It is a ploy to smear the name of the Government in the eyes of the world." Such priceless insights. You baffle me most times with your bufoonery Samy. And you also featured the farmer too. WHY DIDN'T YOUR REPORTERS GET DOWN TO GROUND ZERO AND TALK TO THE PEOPLE AT THE RALLY? WE BLOGGERS DID! And the farmer said, "Other races have poor too." That statement caused a sonic boom. We dont need a farmhand to tell us that. 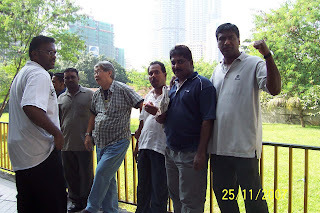 We lived amongst the abject and morbidly poor Malays, Indians and Chinese, lah. Choose credibly lah Wong-ah dignitaries who can say something of consequence. And Wong-ah, you would not get your bonus and maybe another datukship if you miss out a comment about OKT. "Ka Ting braves Hindaf crowd to attend function". Coward! He has body-guards and out-riders(?). Moreover the crowd was peaceful.....I was with them when we passed Corus Hotel. He was afraid foreigners would get a wrong impression. Hello, chief RD, the whole world already knows that courtesy of your fellow running dog, now forced to get out of the country.....that a la ka zam lackey of yours. OKT shut up will you. You will not speak for me. Overheard in the Star newsdesk: We need a young voice to make a comment on this Hindrah. No Vera may cause a back-fire, Jocylene....no she is Chinese and UMNO-bias....Bung...he says he lost his ten-foot pole....Joe Kuda? You crazy ah, he writes about running horses, not running dogs. What about you Krish? No?....then get me anyone......but muzzle him....Print, only when I say so. And thus, came along one Joseph Raj. He pontificates: At the end of the day, it is in the hands of the Indians whether they want to do better for themselves and their future generations. Street protests are definitely not the answer. In 1967, I was arrested for leading a street protest when our National Union of Teachers went on strike. I was a guest of the Campbell Police Station for 7 hours. Khir Johari after that decided to negotiate. We knocked glasses before this. 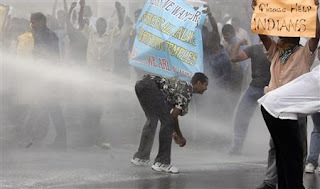 Young Joe, you do not know the power of a mass rally. Why don't you write a good piece on HOW I CAN HELP ALLEVIATE THE PLIGHT OF THE POOR INDIANS. You are young. Dont get shackled so easily. Dont let your editors use you. Truth, unexpurgated truth must result when you hit the keyboard. Get out where you can run free instead of joining the ranks of somebody's hired running dog. 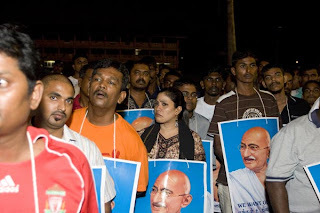 Dont go near the 25 Indian NGOs who opposed the rally. They too are running dogs of the MIC. I will be looking forward to your next comment. TODAY I DEDICATE THIS POSTING TO THE UNSUNG INDIAN HEROES AND HEROINES. TOMORROW I WILL SCORN THE CHINESE AND INDIAN RUNNING DOG OF THE STAR. LIKE I SAID ON THE EVE OF THE RALLY, IT IS NOT ABOUT HINDRAF. 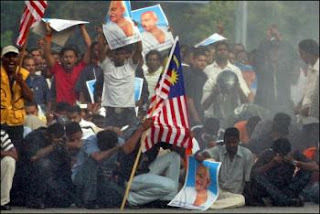 But it has everything to do with the marginalised Indians, Malays, and Chinese, especially the destitute and abject poor. I dedicate this postings to the Malaysians Indians who sacrificed their rest day to make a peaceful stand for their disadvantaged fellow-citizens. helping or harassing?You can guess what spin the media will give to this. 5 armed versus 1 unarmed...brutality or bullying? they came men and women despite warning of arrest....that is courage in the face of adversity. 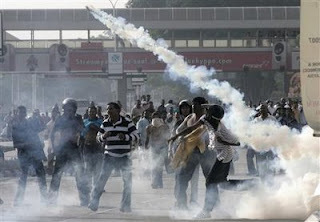 the tear-gas cannisters were ejected into the crowd; does international law allow this? 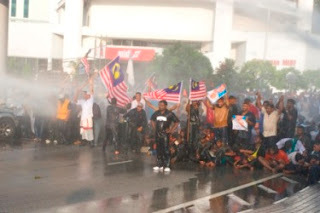 they stood or sat and took the full blast of the chemical-laced water cannon...at flag-bearing Malaysians? But God is definitely watching.....from a distance. this jet could maim ..... but the law of the jungle allows this....really can the PM and DPM sleep soundly when their citizens are treated such? You think they care? Does this look like a confrontation? A SUNDAY WALK WITH MY BROTHERS AND SISTERS. As we walked together with the Bar Council Monitoring Team towards Jl. Ampang, the gathering gathered force by the time we reached the Renaissance Hotel. 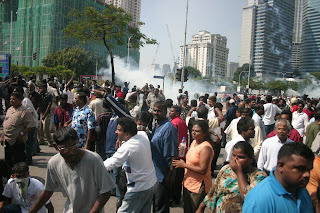 As we walked towards the Wisma Selangor Dredging the air had this irritable pungency that stung the eyes. Earlier the Police had unleashed their chemically laced water canon and lobbed tear gas into a crowd, irregardless of some people having their Sunday breakfast at one of the sidewalk joints. We could not move forward. During this respite, I gave my mineral water to a participant to wash his already teary and bloodshot eyes. I urged him to give his eye a good wash afterwhich he returned the bottle to me, saying, “Uncle keep some for yourself.” That encapsulated the spirit of the day; caring for and sharing with one another. 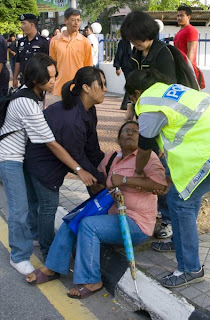 I HAVE BEEN WONDERING HOW COME THE RED CRESCENT AND THE ST. JOHN AMBULANCE ARE NOT AROUND TO RENDER AID? AREN’T THEY INDEPENDENT, WELFARE AGENCIES, PLEDGED TO GIVE MEDICAL AID TO FRIEND OR FOE? SOMEBODY, GIVE US AN ANSWER PLEASE! Except for the acrid haze enveloping us, a calm descended as progress was impeded by a phalanx of red personnel carriers. 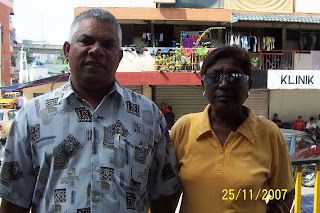 I took a dicey chance but told Kumaresan from Sri Petaling that despite this the Indians will still vote for MIC. 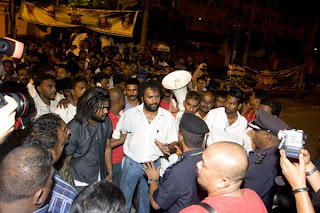 His immediate retort had a finality about it: “Not this time, uncle.” However, Kumaresan’s friend, seemingly angry at my statement asked: “You Chinese, why are you here?” “To support you,” I shot back. And he shook my hand. It was a meaningful handshake. It conveyed gratitude and determination. Jokingly while shaking my hand, he said: “I thought you Special Branch, uncle.” How do I qualify for this tag? 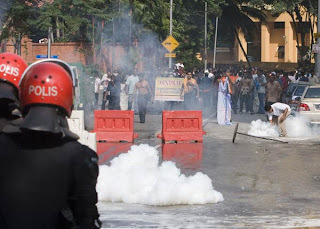 At around 9.30am, we heard some loud clapping and cheering that was eventually followed by the sharp popping sound that heralded the launching of volleys of tear gas.
. We retreated back to Saloma Restaurant. they derive pleasure from inflicting pain or violence. At 2.40pm Haris messaged that the organizers had asked the gathering to disperse peacefully. That I am sure the people did. Generally, the tone was peaceful except for some shouts of warnings and cheering. I did not hear any tauntings and booing. But, I bet a round of beers, that this overwhelming crowd will never vote MIC again. Let me just volunteer this to the party in power: “DON’T GIVE OPPORTUNITY FOR THE MASSES TO HATE YOU. TRY CONSCIENTIOUSLY TO RECALL WHAT STARTED THE FRENCH REVOLUTION. I WILL HELP YOU. WASN’T IT HATRED FOR THE RULING CLASS AND THEIR RUNNING DOGS? 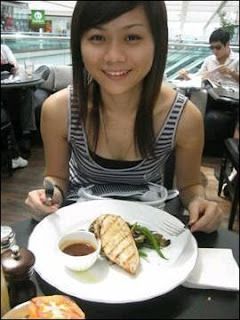 For more updates, visit: I Am A Malaysian, Screenshots, Nat Tan and Shangai Fish. Pics courtesy from above blogs. WHAT COCKAMAMIE? NOTHING DECENT TO SAY, ZIP! SHAME, SHAME, ALL THE MONKEYS KNOW OUR NAME. THE RUNNING DOGS OF ARMNO! AN URGENT APPEAL TO MY KING. ZORRO'S FERVENT PLEA AND HOPE. HOW LONG CAN YOU HIDE (FROM JUSTICE)?